Spring in the wineries and cideries! With the snow a distant memory, the daffodils blooming and the trees and vines budding, it is time to catch up with the Olympic Peninsula wine and cider makers to learn more about what is happening behind the scenes. After the rush of harvest, stemming and crushing and pressing the grapes and apples, the wine and cider takes a more leisurely path forward through fermentation, barreling, aging and bottling. After crush, red wine begins its fermentation process with the skins still part of the mix to give it the red color. In red wine, fermentation causes the fruit to rise to the top of the tank. The wine maker has to be punch the fruit down or pump the wine over the skins during the fermentation to ensure a complete process. White wines and ciders are pressed during crush and the sediment settles to the bottom and removed before the liquid is tanked for fermentation. The wines and ciders are transferred to clean barrels or stainless steel vats to age after fermentation. White wines and ciders might be bottled within a few months, whereas red wines may age in barrels or vats for 18 to 24 months. We have recently moved our bittersweet blend (estate fruit only) from fermentation tanks into whiskey barrels for final maturation to create Finnriver Fire Barrel Cider. Multiple blends of high acid (sharps) fermentations are being combined after filtration, to begin a final stride towards Finnriver Golden Russet Cider. The 2016 Pommeau is also out of barrels and spending a few weeks with itself in a single vessel before bottling. In the wineries, the winemakers were busy over the past month racking – moving the wine from barrels to other barrels or vats in order remove sediment. This process happens up to three times before bottling and allows the winemaker to assess how the wine is developing, and if changes need to be made. The wine might be moved from a new barrel to an aged barrel to help soften the tannins. In some cases, the wine is moved from large casks to smaller barrels to allow the wine to have more contact with the oak. The process is hard work and messy, but the results are wines that are well balanced and clear. In the vineyards and orchards, buds and blossoms abound. Much of the heavy pruning work is done after the leaves are gone from the branches and buds, but the more intricate work starts as the weather begins warming. In the vineyards, workers will thin the suckers sprouting out of the vines to provide a stronger foundation for growth as well as shaping the vines. As the buds begin to break open, decisions will be made as to which shoots will be allowed to grow and which will be added to the compost pile. In the orchard workers are also pruning trees to allow for the best fruit growth and harvest. Grafting is also taking place in both vineyard and orchard to prepare replacement plants for those that age out of production or are damaged during the year. The 2019 Wine, Cider and Cheese Tour is great time to catch up with your favorite winery or cidery and those that produce the beverages you love. This tour is laid back with plenty of time to chat with your fellow “tourists.” It is the perfect time to meet up with old friends as well as meet new wine lovers and discover all you have in common. Of course ~ it is the perfect time to taste all sorts of interesting wine and cheese pairings! 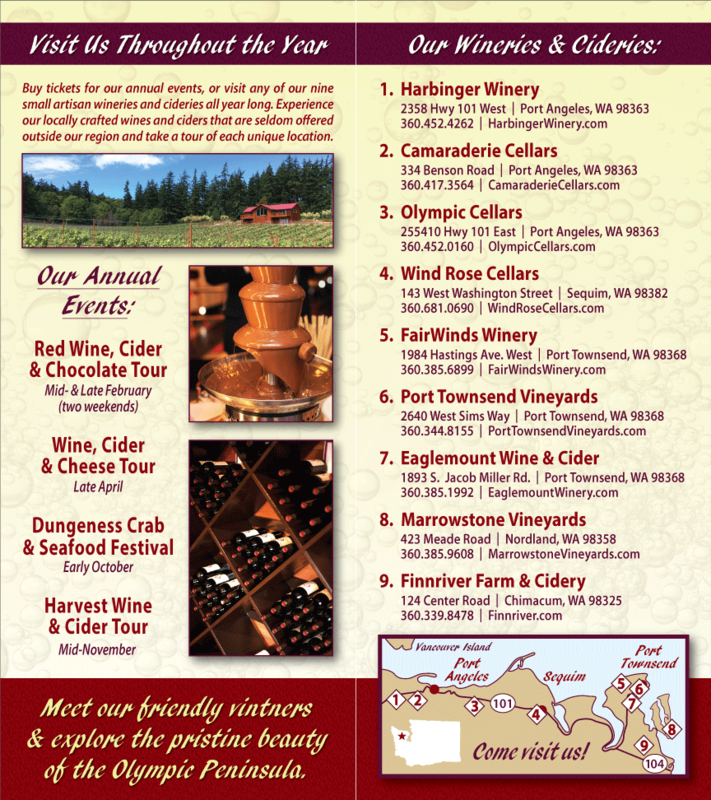 Olympic Peninsula Wineries is excited to welcome you for Red Wine, Cider and Chocolate. Hopefully you have been keeping up with the activity on Facebook to see all the exciting activities, food and wine that will be happening during our event. We want to update you on a few changes that you will notice during Red Wine, Cider and Chocolate. Washington State Liquor and Cannabis Board contacted our winery association just before Christmas to let us know that we need to Change the way we’re running our tours. The biggest change that you might notice is that there will be a sign that says “Tour Tasting Here”. One of the requirements for the LCB is that the “Ticketed Tour Event” tasting areas and the wineries/cideries’ tasting areas are kept separate. When you check in, whether at your first stop or your last stop, you should be sure to get your passport stamped. If a member of your party will taste at only one or two of the wineries and didn’t purchase a ticket, please let the check in person know. They will collect the $10 tasting fee and make sure that they taste in the correct area. Please be patient with us all as we work to comply with these new requirements. We look forward to sharing good food, excellent wine and friendship with all of you. Thank you! As the days get shorter, the nights get cooler and the school busses show up on the roads, we all know that fall has arrived. For some of us, fall means rousting kids from their beds to be on time for school, watching the leaves change color or going to and from work in the dark. For others the arrival of fall means gathering the harvest, whether that is vegetables, grains, apples, pears or grapes. For the members of the Olympic Peninsula Winery Association, it is time for long drives, crush, pressing fruit and fermentation. On November 10 and 11, the nine member wineries and cideries will open their doors and invite you to celebrate the bounty of their 2018 harvest. Before that celebration occurs, there is time for you to learn more about how that harvest turns into wine and cider. For the wine makers, the process begins early in the year when they visit vineyards – primarily in Eastern Washington – to review the vines and fruit and determine how much and what types of fruit to acquire. The wine makers develop close relationships with the vineyards where they purchase fruit. Some vineyards will work with the vintners to plant specific varietals for experimentation or prepare specific irrigation plans to affect sugar (and alcohol) content. Several of the Olympic Peninsula wineries are crushing varietals new to them or expanding the use of out of the ordinary varietals from Mourverde to Pinot Meunier. Visits later in the summer and early fall help the wine makers finalize their plans for upcoming vintages as they measure sugar and pH levels and learn what varieties and quantities survived the weather, disease and other obstacles to be harvested. Four of the members of the Olympic Peninsula Winery Association grow a portion of their own fruit. Port Townsend Vineyards and Marrowstone Vineyards grow a portion of their grapes on or near their wineries. While the weather on the Peninsula isn’t ideal for growing grapes, these two vineyards make the effort to fight powdery mildew, wildlife and a variable number of days over 70 degrees to bring the entire process of making wine closer to their customers. Olympic Cellars also has a small vineyard at their facility, but due to the windy location, the vines don’t produce fruit. Finnriver Farms and Eaglemount Winery|Cidery both have well established orchards on site for their hard ciders. They supplement their fruit supply with stock from other orchards, but make it a point to have specific labels that are developed from local fruit. These members have the added opportunity to connect with consumers through farm tours and other events that highlight the connection between the land and the final product. Come back soon to catch the next step in the process called harvest! In celebration of the warmer weeks ahead of us we are proud to unveil a plethora of mouthwatering and refreshing wines. Some of these tasty treats are in limited supply and won’t have the opportunity to reach the public eye for more than a quick blink. Stop by at one of our nine participating wineries over the weekend to experience a special sampling of these wines. 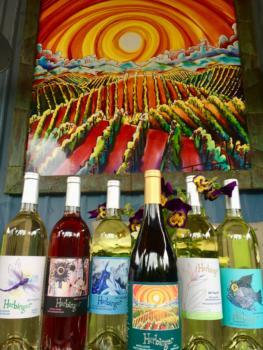 Don’t miss this extremely limited release of Summer Wines from Harbinger Winery’s Small Batch Research Project! 2017 Pinot Grigio deliciously balanced rich and with more body than your typical Pinot Grigio. Great with shellfish and white fish. 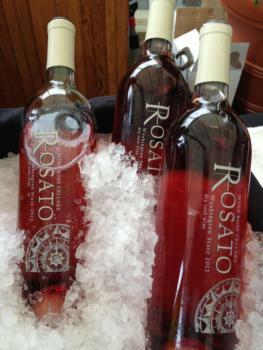 2017 Rosato, dry rosé. Layers of flavor and acidity make this on of our best rosés. Great with just about any food pairing.We have also released a new label for us: Barrel select. These three wines were a very limited bottling. We only produced one barrel of each of the below wines: 25 cases of each. 2016 Carménère very rare varietal for Washington.The palate has hints of spice, licorice, cocoa and savory herbs. The wine has a finish of mocha, raspberry and black tea. Pairs nicely with herbed meats, grilled tuna and goat cheeses. 2016 Cab Franc On the palate, Bing Cherry, raspberry and vanilla are supported by smooth tannins. Plum, black tea and hints of walnuts give a lingering finish. Pairs nicely with soft cheeses, pork and poultry. 2016 Petit Verdot On the palate, the wine has bold fruit flavors of black berry, dark plum and currant. The wine has a finish of dark chocolate and ganache. Pairs nicely with lamb dishes, BBQ, and aged cheeses. FairWinds Winery offers a “no tasting fee” weekend–no tasting fee for anyone! In addition, we are releasing our first blush of the summer– a little sweet, a little tangy. We are also closing our our Chardonnay line @ $12 a bottle or $120 a case. Did i mention no tasting fee? This month, Camaraderie is releasing two great summer wines: 2017 Pinot Gris and 2017 Rugosa Rose. Also new this month is our 2014 Malbec and 2015 Dolcetto—wines that will pair well with summer picnics and BBQs. Join us this weekend for a special summer release of Finnriver‘s beloved Lavender Black Currant Botanical Cider featuring organic Washington apples, organic black currant juice and locally grown organic lavender from Wilderbee Farm, Jardin du Soleil Lavender and Purple Haze Lavender. We will also be serving locals bratwurst, summer salads, wood-fired pizza, vegan ice-cream and more! Now open EVERYDAY from 12-9pm! Get your updates here: www.finnriver.com/music. Dark pink color. Fresh tasting. Flavorful, fruity and slightly sweet, this version of Rosie tastes of fresh strawberries. A delicious Syrah Rose’. 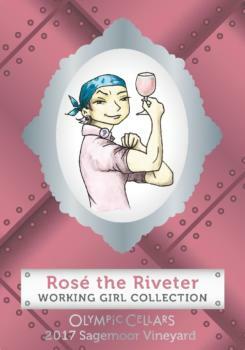 Rosie’s ‘can do’ attitude shines through in this wine. Bottled in limited quantities, this blend of Cranberry and Chardonnay and Riesling is medium-bodied with a fruit-filled Cranberry finish. Tart, crisp and just a little bit sweet. Enjoy on the patio with a fruit and cheese plate. A unique lighter style red blend of Touriga (50%), Souzao (25%), and Merlot (25%). This wine will pair beautifully with your summertime meals. It tastes of berries and smoke with a lovely touch of vanilla on the finish. 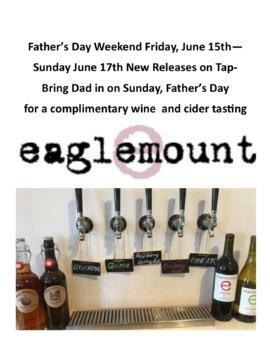 Join us out at Port Townsend Vineyards this weekend as we celebrate dads, grads, and our One Year Anniversary! On Friday, June 15th, from 5p-8p, we’re having our One Year Anniversary Party with live music, lawn games, wine raffle, and food from Hama Hama Oysters and Barbarian Burgers. Free and all-ages! We’re excited to be pouring some of our summer favorites in our tasting room, open daily at noon, til 7 Su-Th, and til 8p Fri-Sat. We’re offering tastings, flights, glasses, carafes, and bottles of our current wines: Discovery White blend, Discovery Rosé, Discovery Red blend, Chardonnay, Reserve Chardonnay, Riesling, Pinot Noir, and Syrah. The holidays are a time when we often worry about selecting the “right” wines to accompany the delicious assortment of foods that will adorn our festive tables — and the abundance of advice that exists can sometimes feel overwhelming. Following are a few tips designed to eliminate the stress of making the “right” decision, so that you can relax and enjoy the day! First, for big holiday meals don’t overcomplicate the wine selection. It can be as easy as simply opening a few different types of wine and letting people choose their favorites. If you have a special, prized bottle of wine in your cellar, bring it up for the holidays and open it before dinner. Let your guests enjoy all of its delicate flavors. This might be a perfect time to offer a toast to those most special in your life. At the table, food takes center stage. So serve several bottles of food-friendly, less expensive wines that blend well with the wide variety of dishes that you are serving. Then, sit back and enjoy your gathering. Several Olympic Peninsula Wineries are offering “holiday” wines, perfect for sipping or for pairing with a variety of foods. Port Townsend’s Sorensen Cellars recently released a 2007 Malbec from Two Coyote Vineyard near Zillah. Beautifully dark and inky in color, with a nose of Mountain Huckleberries that carries over onto the palate. A terrific wine to go with hearty winter stews and cassoulet. $20.00 per bottle. Place orders at the winery at 360.379.6416. Perfect for the table, Olympic Cellars’ Cranberry Jubilee holiday wine is medium-bodied with a fruit-filled cranberry finish. Crisp, and just a little bit sweet, the wine is decadent with leftovers from your turkey dinner. $15.99. 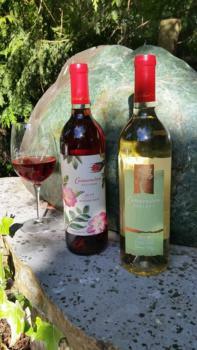 Harbinger Winery, also in Port Angeles, just released its 2008 Cranberry Bliss, an off-dry blend of Barrel-fermented Rose, Chardonnay, and Cranberrry wine. The cranberries are harvested from a bog in Grayland, Washington. The wine is a great match for just about any holiday “gastronimical situation,” be it salmon, sushi, or ham. About 50 cases are available to the public, and they will be gone by the New Year. Pick up your bottle today! 2. How did Port Townsend get its name? Answer: Captain George Vancouver originally named the city “Port Townshend” in 1792 for his friend the Marquis of Townshend. 3. Which Native American tribes were located in what is now Jefferson County in the mid-19th century? Answer: Chemakum (or Chimacum), Hoh (a group of the Quileute), Klallam (or Clallam), Quinault and Twana (Kilcid band-Anglicized: Quilcene). 5. What are the 7 stocks of fish found in the Dungeness River? Answer: Chinook; Chum; Coho; Pink; Steelhead; Cutthroat and Char. 1. The Olympic Peninsula is home to the only rainforests in the Continental United States. These forests are among the rainiest places in the world. 2. The Quinault Valley is called the “Valley of the Giants” because 6 of the world’s largest species of evergreens reside there in relatively close walking distances from developed areas. 3. The Hood Canal town of Quilcene is world famous for its oysters. 4. At 7,980 feet, Mount Olympus is the highest peak in Olympic National Park and has the third largest glacial system in the contiguous U.S.
5. Where on the Olympic Peninsula can you find a herd of Roosevelt elk? In the cities or Brinnon, Sequim and Forks. Passport Wine Tour This Weekend! Remember – it’s B.Y.O.G. (bring our own glass)! The Olympic Peninsula Wineries invite you to come out and enjoy award-winning handcrafted wines superbly paired with fresh Olympic Coastal Cuisine during the Passport Wine Tour this weekend, November 14-15 from 11 a.m. to 5 p.m. We’re adding a new twist to this year’s event — bring your own glass! It’s a fun opportunity to show off the most unique piece in your collection. We look forward to pouring our wines in your special glass and hearing what makes it your favorite. Tickets for the self-guided tour are $25.00 and entitle holders to a label collection Passport, complimentary wine tastings and samples of local cuisine at each winery. For the past couple of weeks we’ve been highlighting what each of our wineries will be serving during Passport Weekend on our blog. Today we’re down to the final two — Camaraderie Cellars and Harbinger Winery, both in Port Angeles. Camaraderie Cellars will feature seasonal tasty bites including roasted beet vinaigrette and wine-poached pears, along with Bell Street Bakery’s seasonal vegetable bread. These delicious bites will be paired with Camaraderie’s favorites: a just released Malbec, Tempranillo, and our popular Viognier. (a reserve Spanish blend with a Rhone twist). These wines will be matched with locally grown foods, including a savory Chanterelle and Chevre blintz made with locally foraged Chanterelle Mushrooms. Fall is a beautiful time to visit the Olympic Peninsula — we hope to see you this weekend! 11 a.m. to 5 p.m.and sample new and current release wines superbly paired with fresh Olympic Coastal Cuisine. Some of the wineries will feature special limited bottlings for the holidays. In Port Townsend, FairWinds Winery’s off-dry Gewurztraminer will be paired with an array of cheeses made by Port Townsend’s Mt. Townsend Creamery. Appetizers made with red potatoes grown on FairWinds Farm served with various toppings will be complemented by the winery’s Cabernet Sauvignon/Merlot blend. Sorensen Cellars will feature its 2008 Pinot Gris, 2007 Viognier, 2007 Sangiovese, 2006 Cabernet Franc, and 2005 Syrah. The wines will be paired with locally sourced appetizers. Get away for a weekend and enjoy autumn on the Olympic Peninsula! With the holidays just around the corner, now is a good time to start thinking about which wines you will serve with Thanksgiving and Christmas dinner. And the Olympic Peninsula Wineries’ Passport Wine Tour is perfectly timed to help with your decision! Visit the wineries on November 14-15 from 11 a.m. to 5 p.m.
and sample new and current release wines superbly paired with fresh Olympic Coastal Cuisine. Some of the wineries will feature special limited bottlings for the holidays. Plums grown and tree ripened in Black Diamond’s orchard are hand processed to make this slightly sweet white wine. Made from Red Rhubarb grown in Black Diamond’s garden and strawberries locally grown in Sequim. A slightly sweet white wine with aromatic undertones, fruity flavors and a spicy finish.